Labels. Going through stores and shops is one of favorite cultural adventures. Seeing color schemes, product marketing and labels, especially products from the US that are marketed with Chinese sensibilities. It’s fun to compare. Furthermore, certain products are just fascinating. I found this cool can-pot-pan transform thing. It’s the simplest design that just captivated me. 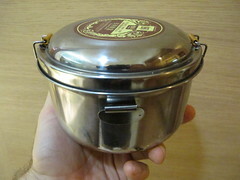 It can be turned into a number of cooking and eating tools. It was less than $1.50 and it’s great for making my morning oatmeal. I can see that it would be great over an open flame, as well. All the parts break down for simple storage.